The Technology in Healthcare Interview with Phil Crompton originally appeared on the Parkin Architects Limited blog. Vantage is working with Agnew Peckham and Parkin on a Healthcare Master Plan for the Children’s Hospital of Eastern Ontario (CHEO) in Ottawa, Canada. This is part two of a two part series – read the the first part of the interview. Q4. How do you help your clients weigh choices? There are a couple of different ways of doing it, but often we consider three factors: how proven is the technology, how much of an impact will it have on the building, and how much of a return on investment can you expect? Given those three factors, if you come up with something that has a huge potential return on investment but has not been implemented anywhere, this is a potential red flag. We don’t want to encourage our clients to be the prototype for these systems when they don’t have to be. Often in this situation, we encourage our clients to find a place within the existing facility to test the technology–a concept unit or mockup space where new ideas can be tested by the staff and feedback provided. If it works, it makes acceptance to that particular technology so much easier after the move into the new building. Especially since moving to a brand-new building with brand new technology is often a concern because there are too many change factors. We model all of the equipment used in a hospital, all the way down to the screens, keyboards, mouse, and even the telephones on the desks. Every piece of technology is collected, which means we can account for it in the design and build the right-sized building rather than an oversized building with inefficient spaces. Q5. How do you balance technology strategy and infrastructure needs? With respect to strategy, systems and infrastructure, Vantage lives in the intersection of those three factors. We always think about one of those in the context of the other. From a systems perspective, we consider the strategic reason for a system and its impact on the infrastructure. From an infrastructure perspective, we ask if it matches our strategy and if our systems will fit. 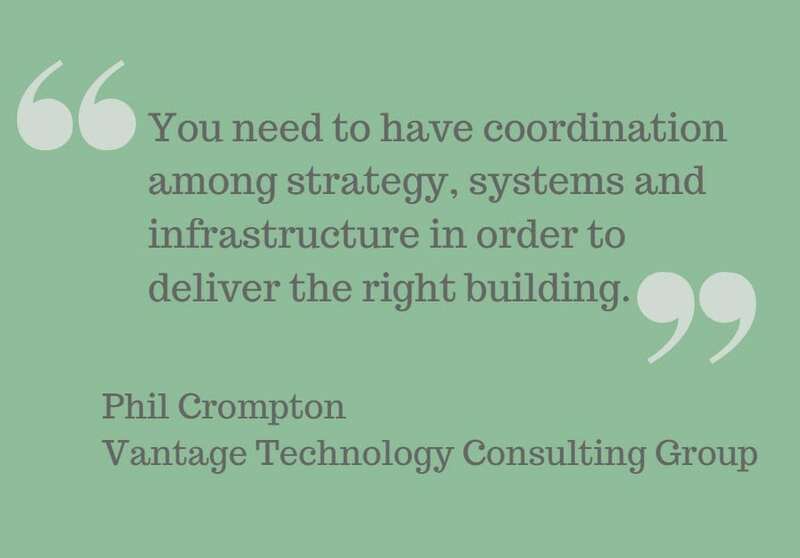 You need to have coordination among strategy, systems and infrastructure in order to deliver the right building. This is what differentiates Vantage in the marketplace. The focus of the firm is to think about these three things in concert, because you need to have that coordination among the three items in order to deliver the right building. Q6. How do account for technology not yet available? We pay close attention to technologies which aren’t quite ready for prime time but which we know, or expect, are coming pretty quickly down the pipe. Things like holograms and 3D imaging, which are one end of the spectrum, always come up with our clients, but until we know how things like holograms are actually going to be realized, it’s almost impossible to plan for them. Sometimes we end up providing a little bit more infrastructure so that we know that we have got something in our back pockets if we need to run a special cable or need a particular power outlet or something like that. We try to build a building that can support multiple generations of technology. A technology generation is 18 months, yet we are building hospitals to last for 50 or even 100 years. We try to build flexibility into the infrastructure to support many generations of technology. That’s one end of the spectrum. We build infrastructure to support many generations of technology. At the other end of the spectrum are a lot of technologies which sound revolutionary but actually are evolutionary in nature, and if you know where to look you can see them coming. That’s things like transparent displays, 3D printing, and wireless power. We can see them coming down the pipe. For example, we were working on a project in the 1990’s and the architect wanted to provide outboard bathrooms in the patient room. The configuration of the rooms would only work if we could guarantee the TV was a flat panel rather than a traditional cathode ray tube box. At this time flat panels cost about the same as a small SUV and it was a $30,000 kit for each patient room. Could the hospital afford this for each patient room? We knew the facility would not open for six years, and given the direction of the market, we knew flat screen TVs would take over traditional televisions extremely quickly. So, we said, “yes, we think it’s a really good bet.” By the time we needed to purchase them for the patient rooms, the prices had gone done considerably. This is one example of where we could see the technology coming down the pike. Yes, the cost of it was unfeasible at the time of the design, but Moore’s Law tells us that technology is going to double in power every 18 months, and there is a curve correlated to that which tells us that the cost of that technology tends to reduce until it becomes commoditized. If you know where to look…you can see technologies that are actually evolutionary in nature. These brand-new systems can be expensive; they are prototypes, and non-standard; however, we know that, over time, they will come down in price and become much more standardized. Q7. What are people most surprised by? Some expect to have the same technology environment they have at home within the hospital, but this is often not possible. At home, you have your own wireless network connection, TV, and Internet provider that you can configure the way you like it, and so visitors to a hospital are often confused about why they can’t have this setup in the hospital. The answer is because we have to support 800 or more beds. With that many people, we have to build a system that is a more manageable, scalable and upgradable, so that it can address all of the potential variations in usage we can expect. The cost of supporting technology in the long term is more than the cost of the building. This is part two of a two part series – read the the first part of the interview.